Glover's Reef, Belize. 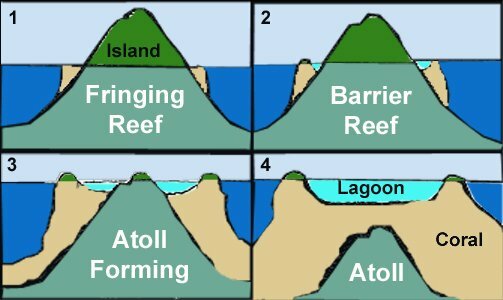 What is an Atoll, and Why is This One Special? 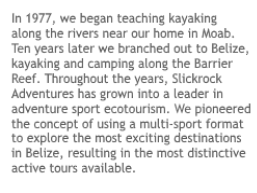 Slickrock owns an island at Glover’s Atoll, called Long Caye, where we offer island vacation holidays. Our private island is located on the outer reef of Glovers Reef Belize. Glover’s Reef is one of only four atolls found in our hemisphere, which alone makes it an unusual and special place to explore. 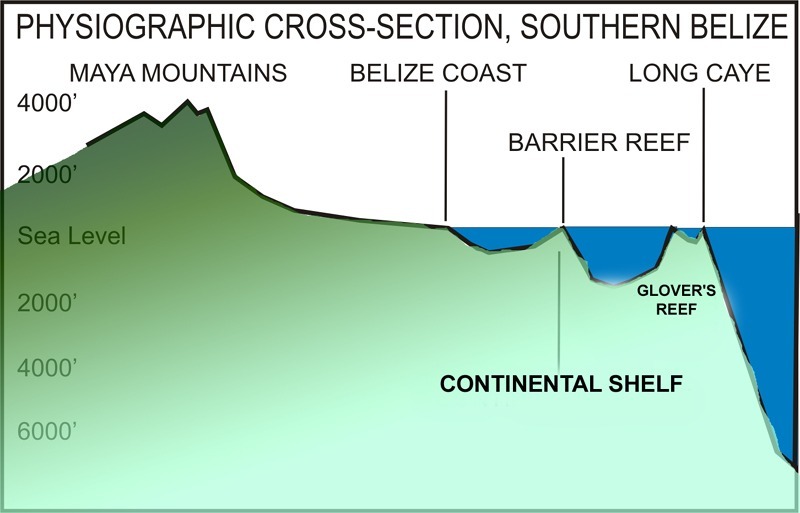 Three of the four atolls in the western hemisphere can be found in Belize country waters (the fourth atoll, Banco Chinchorro, lies just north in Mexican waters). Glover’s Reef is a protected Marine Reserve, more can be found at the Glover’s Reef Marine Reserve website. Belize Barrier Reef snorkeling is a reason in itself to travel to one of the atolls of Belize, which have both the most pristine and the closest to shore snorkel areas in the country. Visit our Glovers Reef snorkeling sites page for a map of the snorkel spots we visit weekly. In the photo at right, the mainland is the large green mass on the left of the image. 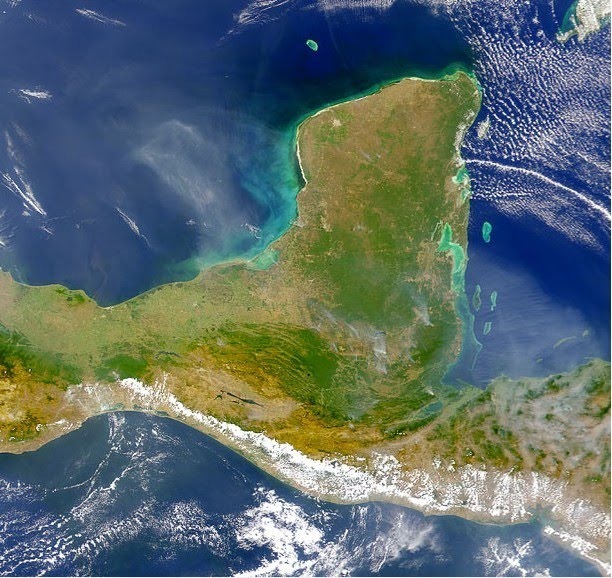 The Belize Barrier Reef is the light- colored edge that parallels the coastline. 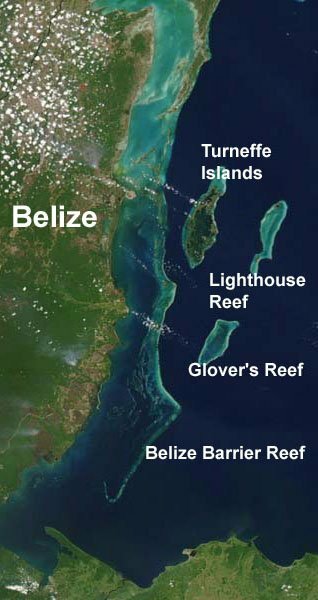 Beyond the Barrier Reef lie the three atolls of Belize: Turneffe Islands, Lighthouse Reef, and, the most remote of all (due to extreme distance from population centers), Glover’s Reef Atoll. 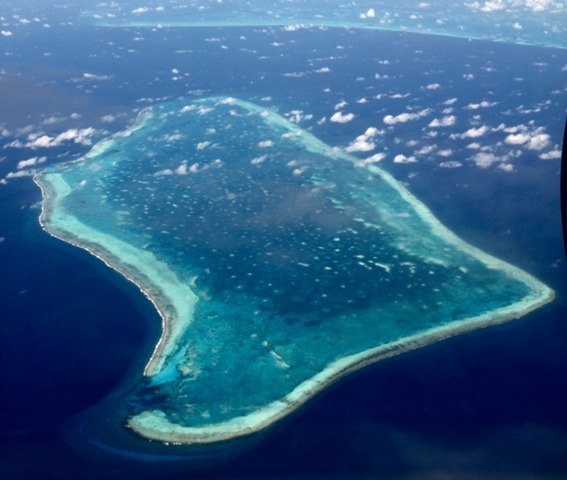 An atoll is a ring of coral that originally grew completely around the shoreline of an island, and which continued to grow upward on top of itself as the island subsided or eroded away. The ring reef we see today at Glover Reef outlines the shoreline of an ancient island (call it Glovers Island) that once existed at this location. This island was exactly the size and shape of present day Glovers Reef Atoll, today an oval ring of coral 54 miles in circumference surrounded by the Caribbean Sea. This Belize atoll was formed about a million years ago. Much much more recently, say approximately 1000 years ago, four tiny islands formed atop the reef ring of the atoll. They are all located on the windward side of the atoll, and are the result of hurricanes breaking coral and piling it up on the reef. The islands of Glover’s Reef are, from north to south, Northeast Caye, Long Caye, Middle Caye, and Southwest Caye. One can observe the various stages of this geologic process on islands and atolls found in the Pacific. The Hawaiian Islands can be considered relatively “young” islands, with coral reefs growing around their perimeters very close to the shoreline. A “mid-stage” atoll would be represented by Tahiti, with a small central island surrounded by a ring reef several miles offshore, sheltering a large shallow lagoon between the reef and the island. Examples of “mature” atolls can be seen among many island groups in the Pacific such as Bora Bora where slender circles of coral surround huge lagoons full of coral formations but with few, if any, central islands remaining. Small islands of sand and rubble, such as those found at Glover’s Reef, are commonly situated on the edges of these atolls. The birth of the islands are not related to the formation of the atoll; they formed much later, and are much more transient. What Makes Glover’s Reef Atoll So Special? Within this necklace of coral, you’ll find more than 700 pristine patch reefs brimming with the richest variety of marine life in the Caribbean – from the delicate fan coral and spiny urchin to the colorful stoplight parrot fish and elegant southern sting ray. Snorkelers and divers alike are enchanted by the spectrum of sea life here, whether they’re wading just off shore or exploring the depths along The Wall, a world-class dive site off the back of Long Caye. One reason The Wall is so spectacular is that it is literally an underwater cliff, 3000 feet tall, reaching within 35 feet of the surface. This shallow reef-crest begins within swimming distance of our shore. This spectacular dive site exemplifies the pristine nature of diving and snorkeling at Glover’s Reef Belize. In recognition of the outstanding natural quality of Glover’s ecosystem, it has been designated a National Marine Reserve and in 1997 was named a World Heritage Site.